Come! Behold this world which is like a royal decorated chariot. Here fools flounder, but the wise have no attachment to it. ~ Dhammapada 171. Monks from several countries including Mahayana monks visited Myanmar during the years 1954 to 1956 to witness the historic Sixth Buddhist Council. Among them was the abbot of the Hosenji Temple of Tokyo who was suitably impressed with the proceedings to send a group of twelve Japanese youths, including a lady, to study Theravada. All twelve were given novice ordination. One of them who eventually ordained as a bhikkhu with the name Visuddhasaya became so absorbed with this new-found Dhamma that he returned to Japan to form the Japan Buddha Sasana Society to introduce and spread Theravada in the country. As a result the mayor of Moji, a coastal town, organized to procure land and construct a vihara. In 1956, the Japanese organizers bought land on top of Mekhari hill in Moji and completed the task. In the following year, a group of six monks from Myanmar headed by Ven. U Nyanuttara arrived in Moji. To further embellish the monastery, a Peace Pagoda with a pinnacle of gold and precious stones was constructed in 1958 to the admiration and awe of the Japanese Buddhists. Since then the dhammaduta bhikkhus have ably disseminated the Theravada teachings by teaching pilgrims that visit the pagoda, holding lectures, meditation sessions. Ordination ceremonies became fairly common. The Ven Vepulla who was a member of this initial group of bhikkhus stayed in Japan for thirty-five years teaching and translating Pali texts to Japanese, before returning to Myanmar in 1991. Recently other Theravada viharas have been established such as one near Tashima, district of Ibrakhi, headed by the Burmese bhikkhu Ven. Sumana, and another in Tokyo with a Sri Lankan bhikkhu. Article by U Ko Lay in the Souvenir publication of The International Theravada Buddhist Missionary University, 1998. Picture 2: Dana to Japanese bhikkhus and bhikkhus of other nationalities. 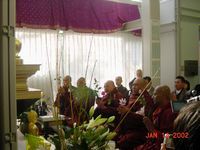 Pictures from Japan Theravada Buddhist Association.